Premise: A small meteor falls from the skies one night, containing a strange blob creature that immediately starts trying to eat people, growing larger and larger in size the more it devours. A teenage couple who witness it attempt to warn their fellow townsfolk only to be disbelieved. Will they convince the authorities before the blob grows too big to be stopped? Okay, pretty sure this movie wins the award for ‘Most Catchy, but Completely Tonally Dissonant Theme Song’. Just listen to this baby. 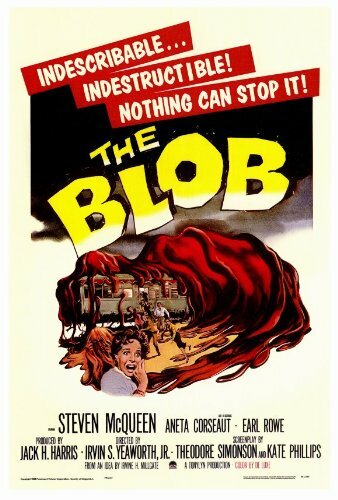 I’m not gonna lie, I love the hell out of that song, but it is not the first thing I’d think of when it comes to a theme song for a movie about a giant killer blob growing increasingly bigger and eating people. It sounds more the intro to a Flintstones-esque cartoon show, or a 50’s dance craze. I dare you to find me a more tonally dissonant horror movie theme song. Anyway, as for the movie itself, I kinda feel it really wasn’t as much of a horror movie as I was expecting it to be when I put it on this list. It has a lot more in common with classic 50’s Sci-fi movies, like It Came from Outer Space, Godzilla or Forbidden Planet, all of which can be argued to have their share of horror elements, but tend to approach their subjects in a more clinical, detached way, rather than attempting to produce serious scares from their premises. Unfortunately, this movie doesn’t really quite live up the standard of the other three movies I listed there, largely because it has a pretty dull beginning. It picks up eventually once the blob grows in sufficient size, but for the first half/two thirds, it’s the basic dull teens trying to warn everyone about the monster and nobody believing them, while the monster picks off idiots and solitary people in what are generally uninteresting kills. Like I said, it is a fair bit more fun once the titular blob starts growing to size and attacking the town, but I’ve seen better monster movies and in that regard it’s nothing special. Part of me is interested to see how the 80’s remake handled it (since I suspect it won’t feel nearly as ’50’s sci-fi’ as this does, but I guess I’ll save that for another time. For now, this was just ‘eh’. Was it Silly? : Fairly silly, yeah.